With over 4 million articles, Wikipedia is an invaluable resource, whether you're throwing a term paper together at the last minute, or trying to find a way to vandalize the Tom Brady page without getting banned again. But follow enough links, and you get sucked into some seriously strange places. We explore some of Wikipedia's oddities in our 4,427,780-week series, Wiki Wormhole. What it's about: By the middle of the second World War, Hitler realized his invasion of the U.S.S.R. had combined two classic blunders—starting a war on two fronts, and getting involved in a land war in Asia. (Eventually, Italy would switch sides, and he’d also be up against Sicilians when death was on the line) With enemies on all sides and Germany’s situation looking increasingly desperate, Der Fuhrer put increasing stock in the development of a superweapon that would turn the tide of the war. While many of them were merely bigger or more powerful military vehicles or rockets with a longer range or bigger payload, there were some genuinely strange ideas in there as well. 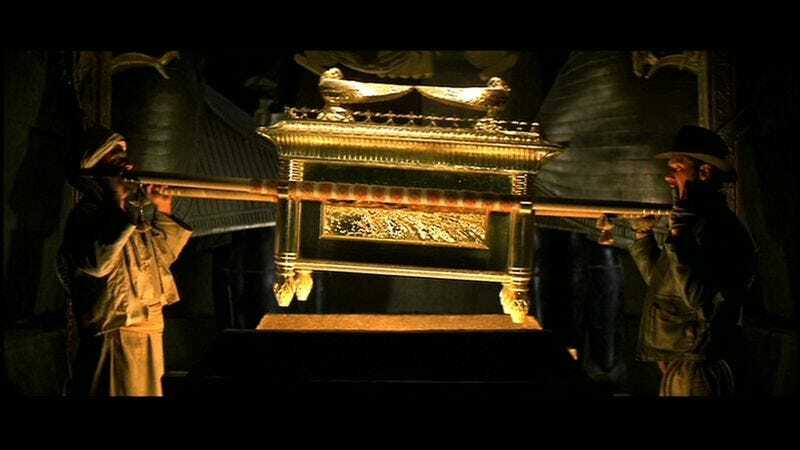 And we’re not even counting the Ark Of The Covenant. Strangest fact: Hitler was the original Bond villain. One of the Wunderwaffe projects was a “sun gun”—an orbiting platform that would focus sunlight onto a fixed point on the ground with a parabolic mirror. In theory, it could burn a city like ants under a magnifying glass. It was an audacious idea, considering Sputnik wouldn’t launch until 12 years after the war ended, and the Nazi sun gun would have been 100 meters wide, compared to Sputnik's 23" diameter. Of course, the Germans acknowledged it would be at least 50 years before an orbital platform was feasible, a rare bit of long-term planning by the Reich. Controversy: Nazis? Controversy? Perish the thought! Surprisingly, given the subject matter, the page is more or less controversy-free, although there’s an ongoing discussion about whether to categorize some of the more left-field ideas as “fictitious” (as they are here) or merely unconfirmed. Thing we were happiest to learn: While the war is often characterized as a “race” between the major powers to build an atomic bomb, the Nazis didn’t consider the bomb a high priority. While nuclear fission was discovered just months before the war began and the Germans were developing a uranium reactor, the Reich decided nuclear power wouldn’t contribute to winning the war, and put it on the back burner. Civilian research institutions continued working on nuclear power, but the project was sapped of resources as the war intensified. And, of course, between suspicion of academics and the Nazis rounding up and murdering Jewish intellectuals, the number of physicists available to work on such a project was perilously low. Also noteworthy: One of the most unrealistic projects on the list is simple in concept. The Nazis were working on several extra-large tanks. They were also working on an extra-extra-extra-large tank. The Panzer IV, the Germans’ most commonly used tank, weighed 25 tons. But plans had been drawn up for the 90-ton Löwe (Lion), the 180-ton Maus, and incredibly, a 1,500-ton Landkreuzer P 1500 Monster (by comparison, the Statue of Liberty weighs 200 tons). Work began on the Monster in 1942, with Hitler’s personal approval, but its designers came across numerous issues. Even the Maus, at one-eighth the size, destroyed any road it ran across, couldn’t use bridges, and was nearly impossible to transport by rail. A 1500-ton tank would also move incredibly slowly, and be nearly impossible for enemy aircraft to miss. Faced with these obstacles, the Monster was scrapped in 1943. Best link to elsewhere on Wikipedia: Those with a genuine interest in military history may want to check out the Japanese equivalent to the page, which has fewer crazy projects and more genuine innovation. For the rest of us who just want to see crazy Nazi conspiracy theories, there’s Nazi UFOs, a category of UFOlogy that claims the Germans successfully built spacecraft during WWII, and that those ships are now stored in secret underground bases in Antarctica or South America.